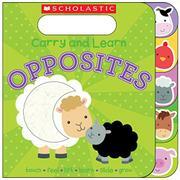 An interactive board book designed to teach the concept of opposites. Like other titles in the Carry and Learn series, this one features a rectangular cutout near the top that allows it to be easily gripped and toted around. Further, a series of large tabs running down the rightmost edge of the volume makes it easy for little hands to turn the pages. However, the title loses its focus on usability and simplicity when it comes to the content. Each left-hand page introduces an animal, while the corresponding right-hand page uses that animal to somehow illustrate a pair of opposites, such as up/down, in/out, empty/full, etc. This is plenty enough already, especially considering the fact that opposites can be complex concepts for a toddler audience. Add to that bubbles that ask readers to make the animal sounds, a running index of the opposite pairs covered appearing on the leftmost edge of the volume, and an arbitrary assortment of tactile and interactive features, and the result is a bit chaotic and potentially confusing.